Love is in the air. | Image courtesy Unsplash user freestocks.org. I’ll never forget my first Valentine’s Day in high school. I was sixteen years old, head over heels for my high school sweetheart, and thrilled to finally be allowed to go on a date on a school night. I waited nervously at the window for him to drive up in his parents’ car, clutching a handmade card and the gift I’d bought him—his favorite cologne and chocolates. When he finally arrived, he came to the door with a dozen red roses, a beautiful pair of gold earrings, and of course, a box of chocolates. I was thrilled, to say the least. As sweet as our gifts were, looking back now I realize they weren’t all that original. Don’t get me wrong, sometimes classic gifts are great. They certainly made me feel pretty special at the time. Nowadays, though, I think there is something to be said for unique, creative Valentine’s Day gifts. 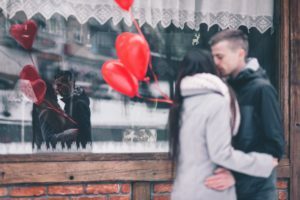 If you really want to woo your special someone this Valentine’s Day and surprise them with something extra thoughtful, I’m going to share my best out-of-the-box Valentine’s day gift ideas (for him and for her) so you can make this V-Day the best one yet. Wallet words of love. 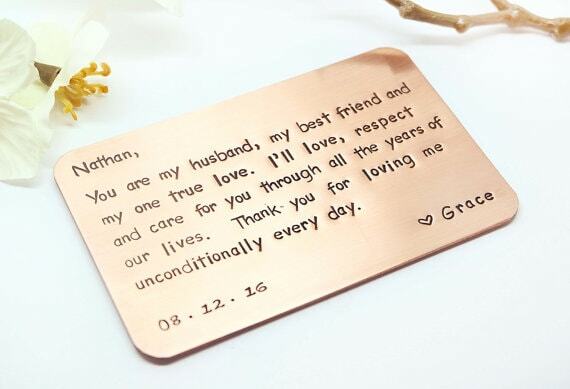 | Image courtesy Etsy seller MetalandIdea. Chocolates, jewelry, and roses are classics, but they’re also a little cliche. That doesn’t mean, however, that you can’t use these gifts as jumping off points to inspire something more unique. For instance, almost every girl loves chocolate, right? So, I don’t think you should ditch the idea altogether, but instead of buying a classic heart-shaped box of chocolate covered cherries, look for something out of the ordinary. Visit your local chocolate shop and browse the shelves for bars or filled chocolates with interesting flavor combinations, like curry or lavender. Or have a chocolatier custom-make one with her favorite flavors. 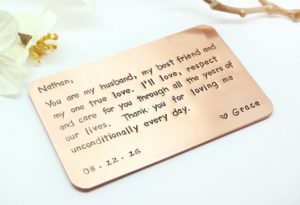 A hand stamped wallet card with a heartfelt inscription: This lovely idea came from a friend of mine who received one of these from her husband last Valentine’s Day. She is so in love with it that she shows it to someone every time she takes her wallet out. All you have to do is write a sweet message for her and work with an artist to create it. Every time she misses you, she can pull it out of her wallet and be reminded of how much you mean to her. It’s a great alternative to jewelry! Better than roses. | Image courtesy Etsy seller SucculentsAndMorel. A pass to a class she’s been dying to try: Has your sweetie been talking about wanting to check out a dance class or try her hand at painting? Let her interests inspire you to gift her an experience she’ll love. Who knows, she may discover a new passion, thanks to you! Bonus points if you choose a class the two of you can enjoy together. A succulent terrarium: Roses wilt and die, but succulents are forever. This means she can enjoy them well past Valentine’s Day. While you can certainly buy her one, I’m sure she’d love it if you made it yourself. All you have to do is find a nice open-top ceramic or glass container, place pretty stones in the bottom, toss down a layer of potting soil, and artfully arrange a bunch of little succulents inside. Once the plants are in place, cover the soil with a thin layer of sand and add a few more stones to make it extra pretty. Whatever you decide to give her, just make sure to accompany the gift with a lovely card with a heartfelt note written inside. It’s always nice when someone puts their feelings in writing. That way, she’ll know it was a gift from the heart. His new favorite shirt! | Image courtesy Etsy seller yummytees. An escape room session: Escape rooms are all the rage, and if your honey is into problem-solving, he’ll have so much fun. If the two of you go together, you’ll enjoy some quality time collaborating and working in tandem to solve the puzzles. 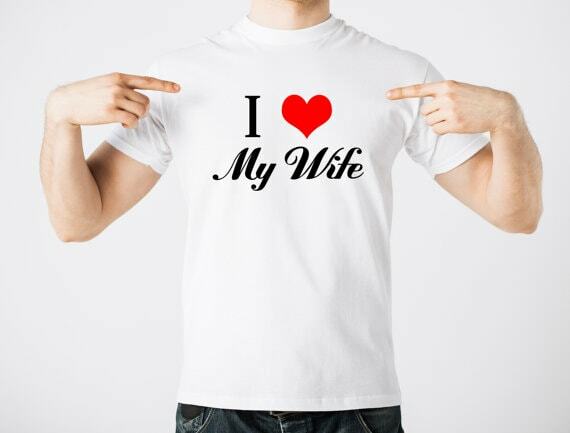 A cute “I love my wife/girlfriend” T-shirt: This is a great gift if your guy has a good sense of humor and isn’t afraid to wear his heart on his sleeve! Not only will wearing it put a permanent smile on his face, it’ll make you feel super special too. A photo album celebrating your love: There are so many great online photobook makers that allow you to arrange your pictures and add personal messages, so why not take advantage of one this Valentine’s day? 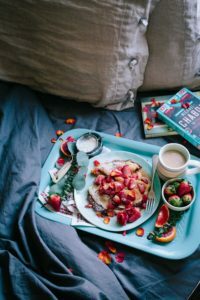 He’ll love the effort you put into creating it, and the two of you can enjoy flipping through it together and reminiscing about all the wonderful moments you’ve shared. I personally love Shutterfly, so if you are planning to make an album, check it out. While I have deemed these gifts for him, anyone will enjoy these amazing gifts, so feel free to gift them to a lady as well. There are no rules on Valentine’s Day, after all! 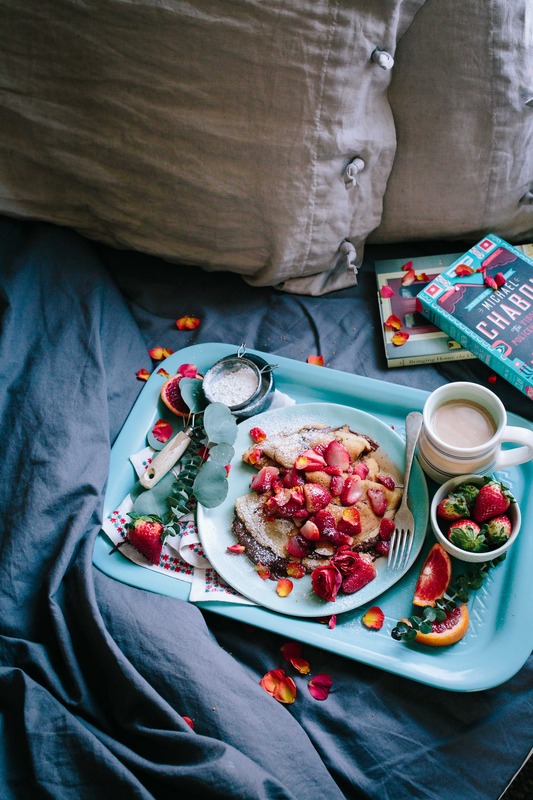 A Valentine’s breakfast in bed. | Image courtesy Unsplash user Brooke Lark. Of course, you don’t need a special someone to enjoy Valentine’s day or to give and receive a nice gift. If you’re kickin’ it solo this year, why not organize an online gift exchange with your single friends this Valentine’s Day? Or, spice up your office a bit and bring V-Day gifts for your coworkers! You can still use the above gift ideas for inspiration and this way, there’s more love to spread around! While everyone loves getting gifts on Valentine’s Day, the most important thing is that you show others that you care about them, whether it’s your special someone, your friends, or your coworkers. Spend quality time with them, give them a hug, or send them a thoughtful email telling them how much they mean to you. 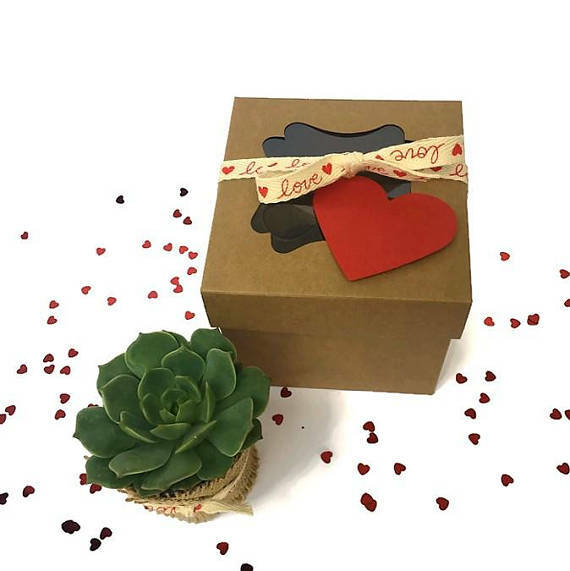 These sweet gestures, along with an amazing out-of-the-box gift, are sure to make this Valentine’s Day the best one yet. For more creative Elfster Valentine’s day gift ideas, check out our Valentine’s Day Gift Guide or start an online gift exchange for a fun way to celebrate the day of love! You can also connect with Elfster on Facebook, on Twitter @Elfster, or on Instagram @Elfster. Courtney has a B.A. in English Literature and a Diploma in Culinary Arts and Pastry Arts/Breadmaking. Holistic health and nutrition are her passions, natural and organic are her two favorite words, and farmers markets make her heart sing. She lives in beautiful Vancouver, BC with her husband where they hike, bike, and hit the beach—but jump at any chance to travel and explore the food and culture of other countries as well! When it comes to gift giving, she likes getting creative in the kitchen and baking yummy treats or going all out by cooking a fancy meal. Sparking Controversy: White Christmas Lights or Multi-Colored?